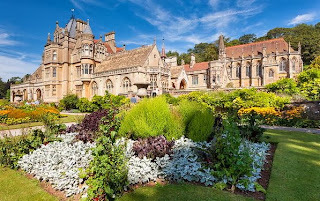 Heroes, Heroines, and History: Touring Tyntesfield, the Setting of The Governess of Highland Hall With Author Carrie Turansky---and A GIVEAWAY! 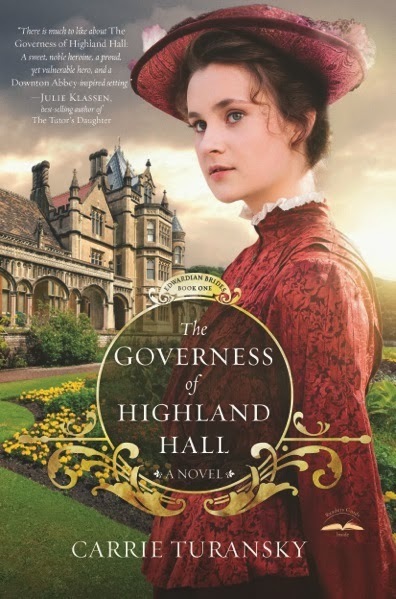 Touring Tyntesfield, the Setting of The Governess of Highland Hall With Author Carrie Turansky---and A GIVEAWAY! Early in 2012 when I started working on ideas for The Governess of Highland Hall, I wanted to find an English country estate for my setting. I am a visual writer, and finding images for my characters and setting brings the story to life for me. I loved visiting Highclere Castle where Downton Abbey is filmed, and I wanted to find an estate that gave a similar impression but was unique. 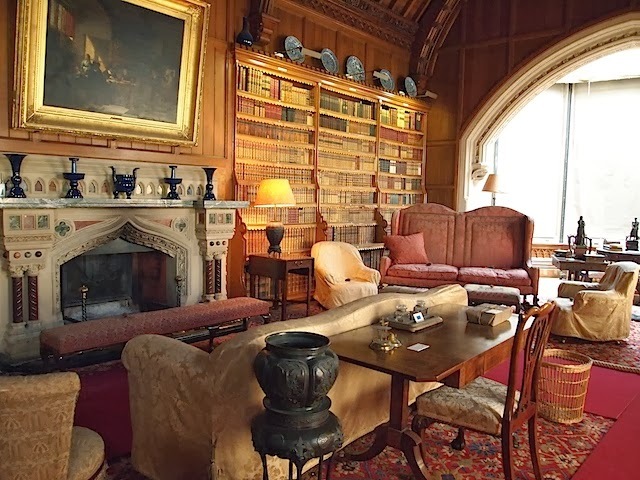 After searching online, I discovered Tyntesfield, and I was delighted when I followed several more links to other images and articles. It was the perfect inspiration for the Ramsey family's Highland Hall. 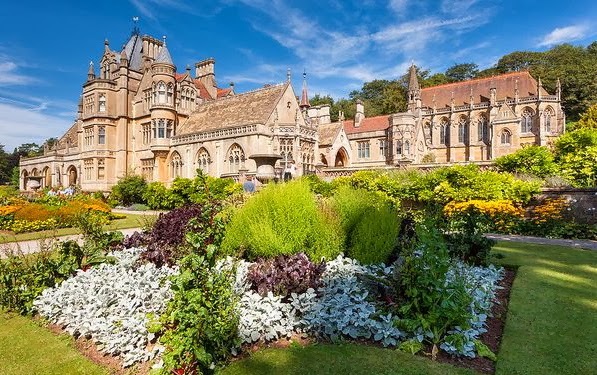 Tyntesfield is a beautiful Victorian Gothic Revival house and estate near Wraxall, North Somerset, England. The house is a Grade 1 listed building, which means it has special historic significance and cannot be demolished or changed without permission from the government. The house is named after the Tynte baronets, who owned estates in the area since about 1500. The location was formerly a 16th-century hunting lodge, which was used as a farmhouse until the early 19th century. In the 1830s a Georgian mansion was built on the site. William Gibbs, an English businessman, who made his fortune by importing guano (bird droppings) from South America that was used to make fertilizer bought the house in the 1860s. Gibbs became the wealthiest non-noble in England for a time, and he enlarged Tyntesfield to become the beautiful estate it is today. William and Blanche Gibbs were very dedicated to their faith, and they had a beautiful chapel added in the 1870s. The estate was passed down to each generation and remained in the family until 2001 when Richard Gibbs passed away. 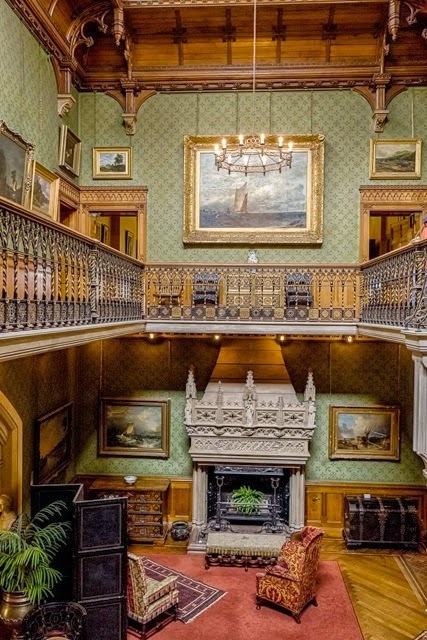 Tyntesfield was acquired by the National Trust in June 2002 after a fundraising campaign was initiated to prevent it being sold to a private party and to ensure it would be open to the public. The first ten weeks after the acquisition, over 189,000 people visited Tynestesfield. They were eager to see the lovely estate that remained very much the same for the last 150 years. Several of the scenes in The Governess of Highland Hall are set in the great hall, the gallery, the library, and the nursery. So I thought you would like to see those areas of the house. 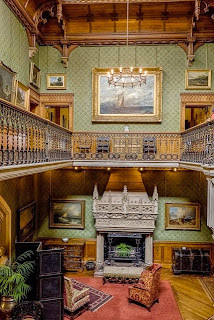 If you’d like to see more photos of Tyntesfield come visit my Pinterest boards. When you do, you can step back in time and meet the Governess and all the characters at Highland Hall. I'm giving away a copy of The Governess of Highland Hall. Drawing is open only to mainland US and Canada. Which room at Tyntesfield is your favorite and why? I love to connect with friends on Facebook, Goodreads, Twitter, Pinterest, and through my website blog. I hope to see you there! I love your pinterest boards! What a spectacular building! I have to say my favorite room is the Stuart Room because it's cozy and I'm loving the huge bay window :) Thanks so much for sharing your source of inspiration! Thanks Heidi, I've really enjoyed creating my Pinterest boards. It helps me organize my research materials and keep all those visuals handy when I want to check them out again or share them with my readers. Hi Patty, this sure is a large house , Tyntesfield, I cannot imagine it as a farmhouse but then added chapel also made it larger. I have seen this book many places and know the story will be great read, thanks for sharing little history behind it. Hi Pol, Tyntesfield is huge! The chapel is beautiful. I think this is an indication of the Gibb's family commitment to their faith. Thanks for sharing your thoughts today. Hi Pudy68, aren't those fireplaces amazing? I think they are mostly made of marble. But I think you're right, it must not have been very warm in the winter! For me, I have to cheat and say it's the gardens! And I love your story Carrie. No need to put me in for the drawing. Hi Julie, Oh, I agree. The gardens are lovely! When we traveled to England touring gardens was a real highlight for me! Thanks for stopping by Julie. Beautiful pictures, beautiful book! Thank you for sharing. Who could choose any room but the library=) I do love seeing all of the woodwork leading into the dining room! Thank you for sharing it's history, such a beautiful estate. Carrie, I would choose the gardens...the kitchen gardens and the flower gardens. Hi Juanita, I agree, the gardens are lovely. Did you see the photo with all the daliahas? So pretty. Isn’t Tyntesfield a beautiful place? I would certainly love to tour it one day. Thanks for sharing these lovely pictures! Wow, Carrie, that place is even fancier than I envisioned. That must have been a wonderful place to tour. I can't imagine living in a house that big. 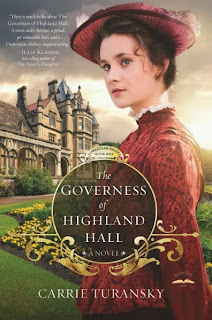 Congratulations on the release of the Governess of Highland Hall! Thanks Vickie! It is a beautiful estate. I espeically love the chapel. How beautiful!! I love the entrance into the dining room the best. What a magnificent house and estate! Would love to go there! I think my favorite is the library. Hi Carrie! I love this post and your pinterest boards! The pictures of Tyntesfield are GORGEOUS and the library is my very favorite room. No need to enter my name in the contest, as I already have copy of your book. Thank you again! Beautiful photos! I love historic homes/buildings. I think my favorite is the Library. So grand with the high ceiling and a wall full of books next to the fireplace. Thanks for sharing! Yes, I love that library room, too...looks so snug and cozy (and lush!). And I'd love to win your novel--the cover is so lovely! Hi Heather, the library does look cozy. Thanks for your complement on the cover. I'm very happy with it and grateful for the designers at WaterBrook! Carrie, I loved all the photos ! The entire estate is amazing. I love the nursery as it has such a cozy and serene look to it! what a special room to share with a child. Loved the colors, the furniture and the rocking horse. The entire setting fits so well with what I picture as your story line. Thank you for the photos and your book. Can't wait to read it. The chapel! What a wonderful room to have in a home. Hi Martha, isn't it amazing! Wow, that's some private chapel. Love the library! Would love to be surrounded by wonderful books, especially on a rainy or cold, winter day. Beautiful place and pictures. I love the library. You're surrounded by great books with cozy chairs and a wonderful fireplace. What a wonderful place to be. Thank you for the chance of this giveaway and please enter my name. Hi Barbara and Sarah, yes the library is one of my favorite rooms too! I think the rooms you showed are all quite wonderful! I think , if I were a child,I would love the great room - I could hide next to the railing and watch the goings on down below. :) Thanks for the giveaway. I would love to win this book! What a fun idea. I do have several scenes in the book where people overhear what is happening in the gallery. I love the library, I could stay there for days on end! I love both of the rooms shown above. I absolutely love libraries (and I love exploring others' libraries). I really like the view of the other room--I like how open it is and the balcony. I think the Chapel room would be my favorite. I can just imagine the serenity, pipe organ, fellowship with God. Oh, I love English country estates! How beautiful this is. I love the gardens the best but the whole estate is beautiful!